Your students will love the Spanish sounds of this exciting and passionate dance, which introduces Act IV of this operatic masterpiece. The expressive opening melody will help develop your woodwinds' lyrical playing, while the intriguing Spanish rhythms and hemiolas will keep everyone on their toes! Careful doublings make this arrangement playable by any group, even those with limited instrumentation! 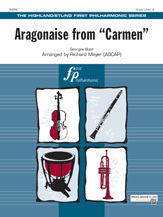 Includes parts for violin III, alto saxophone, bass clarinet, and piano.